One of the most difficult stains to thoroughly remove is urine. If a pet urine stain is attempted to be cleaned by the inexperienced carpet cleaning technician or without the proper steps, the odor will re activate and the stain will re-appear. This is a task which should be performed by the experienced. At O.G Professional Carpet Care you can be sure that we will treat and remove pet urine in your carpet. Its important to pre treat pet urine stains correctly with an enzymatic digester at least 12- 24 hours before the actual cleaning of your carpet. Regular carpet cleaning has very little or no effect on odor and stain causing bacteria. 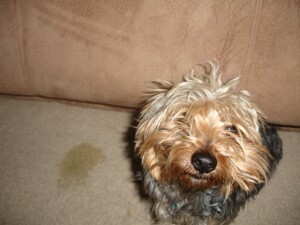 Pet urine stain pre treatment estimates for your home in the Grand Rapids area. Our prices are very reasonable, we charge less than you would expect for such outstanding results.